Happy Wednesday, Marblelous! Many of us are no strangers to the benefits of drinking tea. In Asia, various kinds of teas are consumed on a regular basis and somehow, there is always a specific herbal tea blend that seems to cure a specific illness or promote some form of health benefit. I love teas, especially the herbal kind; however, after spending two years in the United States, I somehow forgot how much I love herbal teas and how often I used to consume these teas. I recently flew back home to Malaysia to visit my family for a month, and boy, was I in tea heaven! In Malaysia, you can find herbal teas in every nook and cranny. From the infamous Luo Han Guo to Water Chestnut drink, the choices were endless. My mom, knowing how much I love consuming tea, brought me to one of the many herbal stores found in Malaysia’s malls to purchase some flower teas so I could bring it back home to Long Beach to consume. I had so much trouble deciding between all the beautiful flower tea options they had, but I finally chose the Kunlun Snow Chrysanthemum Tea and Rose Bud Tea. The Kunlun variant of Chrysanthemum is more expensive because it is a rare flower that is grown only in the Kunlun mountains in Xinjiang, China. It was my first time trying out this variant and I must say it definitely has a richer taste compared to the regular Chrysanthemum tea that I am used to drinking. This particular variant of Chrysanthemum tea contains high amounts of amino acids and proteins, which in turn lowers blood sugar, reduces high cholesterol, and prevents heart diseases. I picked the Rose Bud Tea mainly because it looks so darn beautiful. 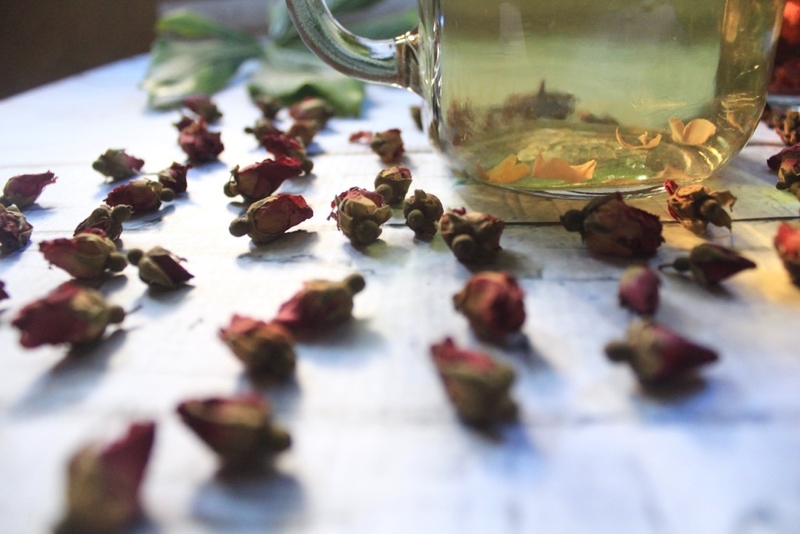 Rose tea is made from whole, dehydrated rose blossoms. When I explained this to my boyfriend, he looked at me with a baffled expression and said, “So….you’re technically drinking roses? !” Haha Rose Bud Tea is rich in Vitamin C, contains anti-inflammatory and antibacterial properties, and aids in the production of collagen, which improves the appearance of skin and hair. It is also known to relieve painful menstrual cramps. 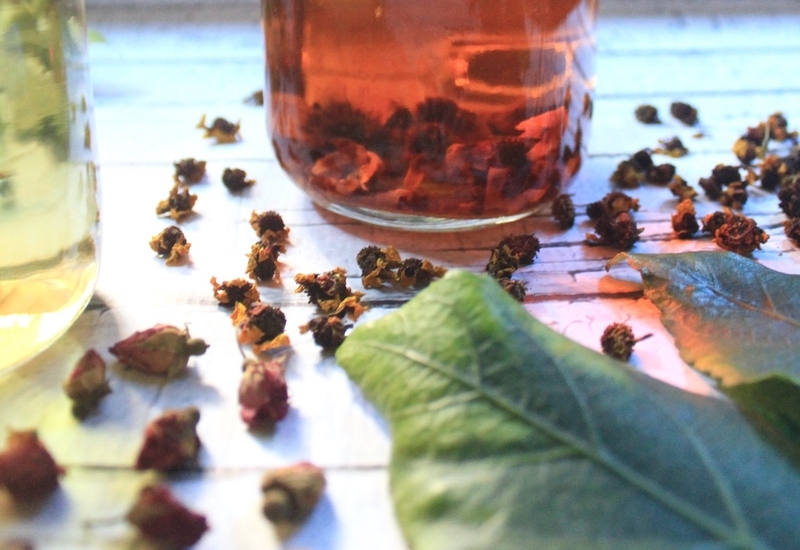 The Rose Bud Tea has a very mild yet sweet subtle taste. If you enjoy drinking green tea, you’d love rose tea. I did some research and found out you can buy Kunlun Snow Chrysanthemum Tea here and Rose Bud Tea here. 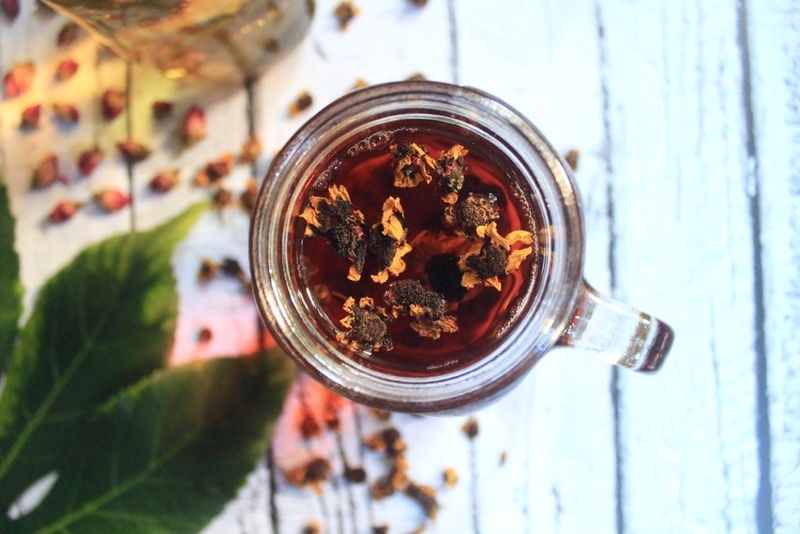 What I like about this online tea retailer is that you have the option to choose the weight of the flower tea you want, which is pretty neat when you want to try out a new kind of tea but a bit hesitant as to whether you will like it. They have various weights available – from a sample size of 0.5 oz right up to a whopping 170 oz! I’ve been wanting to try this Purple Myosotis Tea for a while now, mainly because it is purple and it looks so beautiful! I will definitely be trying it once I am done with my current stash. 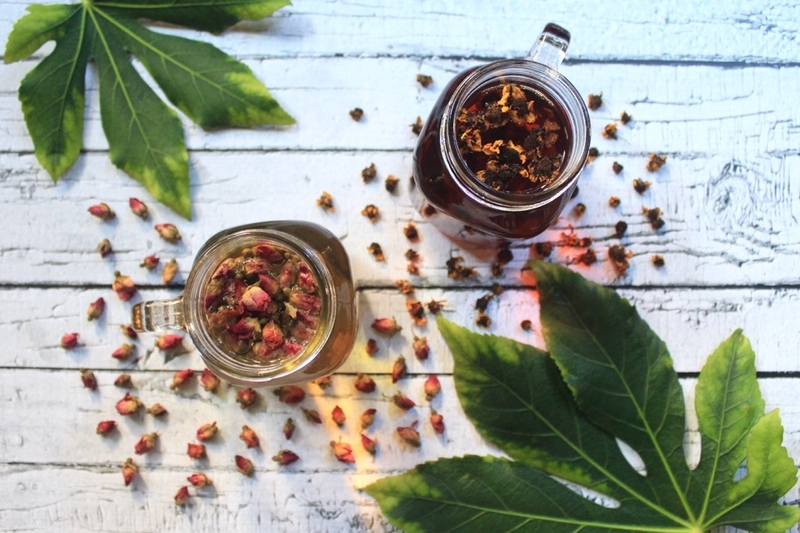 Have you tried any flower teas? What are your thoughts about flower teas? This tea sounds AMAZING! Ever since we got back from Japan last year we have been OBSESSED with fresh brewed tea! such a great post! I need to drink more tea – it’s benefits always seem so great! thanks for sharing! This sounds amazing! 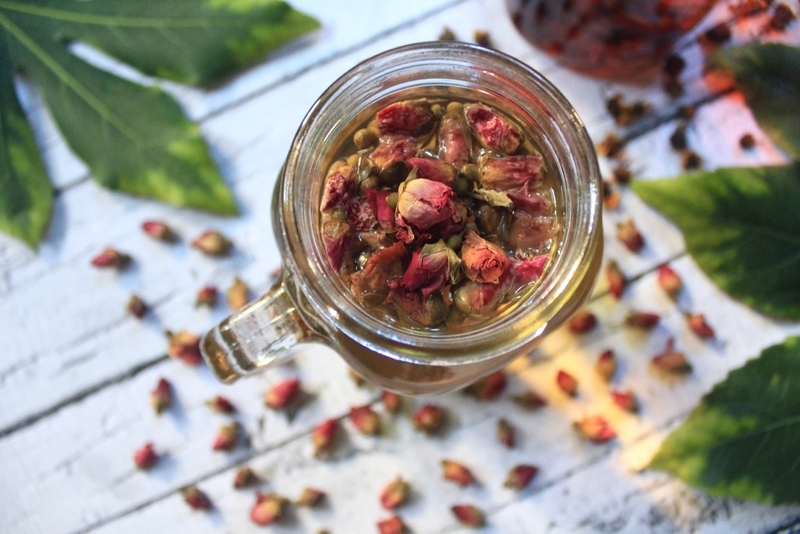 I’ve never had these flower teas but am thinking I need to start “drinking roses” asap (seriously all those benefits are just too good not to!). i love anything with rose, this sounds so good! Love this! I love love tea so I will definitely be checking this out! I loved your photos here too girl! BRAVO! I’m definitely a huge tea person, but I’ve yet to try flower tea. Your pics are gorgeous! your pictures are SO beautiful. makes me want this tea simply by the beauty of the photos. I love Tea! And this looks really good! I have to try it! Your pictures are AMAZING!! Great post!